Affiliations: Department of Blood & Marrow Transplant and Cellular Immunotherapy, Department of Immunology, Department of Clinical Science, H. Lee Moffitt Cancer Center, Tampa, FL, 33612. Division of Biomedical Informatics, Department of Clinical Sciences, University of Texas Southwestern Medical Center, Dallas, TX, 75390. Morsani College of Medicine, University of South Florida Health, Tampa, FL, 33612 . 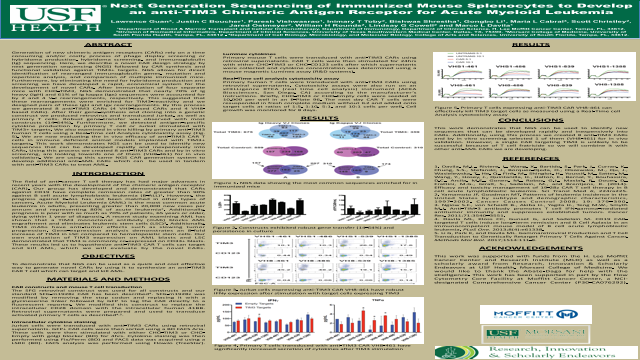 Department of Cell Biology, Microbiology, and Molecular Biology, College of Arts and Sciences, University of South Florida, Tampa, FL, 33612.
repertoire analysis, and comparison of multiple immunized mice. with anti-TIM3 CARs to treat AML. Frattini, M.G., Giralt, S., Sadelain, M., and Brentjens, R. (2014). cell acute lymphoblastic leukemia. Sci Transl Med 6, 224ra225. 1997-2002. Cancer Causes Control 2008; 19: 379–390.